I love comics. That’s an obvious statement given my website title and everything I’ve written on here before, but sometimes, you can forget why you truly love comics. And that’s mainly because I read so many comics. Sure, I have characters I love and stories that I love, but comics themselves agitate me sometimes. There’s a formula that’s used when writing comic books, and it frustrates me when writers and artists are forced to stick to a formula. Let me back up a bit and acknowledge there’s a formula in almost everything humans do in life. Be it movies or music, there’s an accepted way on how things are done. It isn’t a bad thing either, some parts of the formula are required in order to succeed. For example, when you’re making a single for music, a basic part of that formula is having a catchy hook and a sing-along chorus. Sure, musicians have been able to get by without having either of those two things, but more often than not, that part of the formula must be implemented to succeed at the higher level. Now, let’s look at comics. What’s the comics formula? Independent publishers and creators tend to deviate from it more often than not, but the big two, Marvel and DC, tend to stick to the same formula. A character talking at the beginning to recap, a character stopping mid-sentence to show a “reveal” on the next page, expositional narration that may slow the plot and feel out of place, and many more. Let me reiterate, that none of this stuff is necessarily bad. Some of my favorite comics have every piece of the formula in it. But my all-time favorites innovate how a story is told. It starts with the characters you’re telling the story about. If you’re writing Batman, there’s certain things you can’t do. Same goes for Iron Man. DC and Marvel are the big leagues, and sometimes they won’t budge for any type of creative idea, the formula must be followed in some capacity. When it’s a less-known character, the writer and artist are allowed much more freedom to tell the story they want to tell. It can be more personal, doesn’t need to connect to the comic universe, and so on. 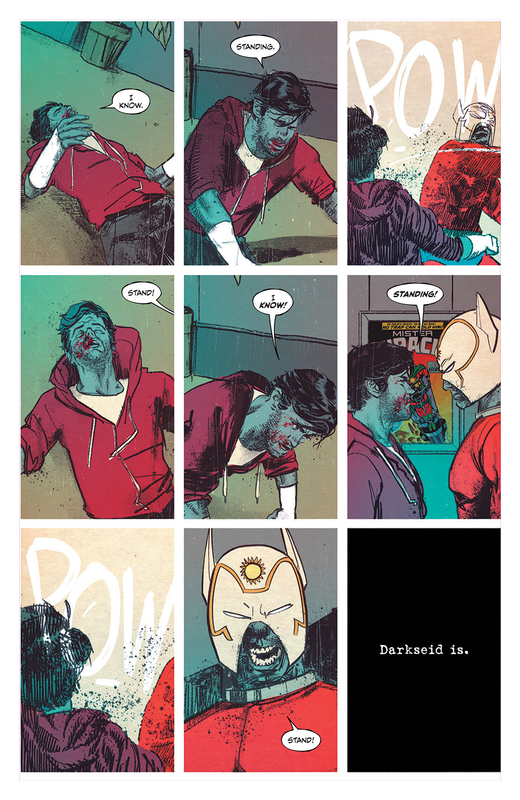 That’s what Tom King and Mitch Gerads are attempting to do with Mister Miracle this fall, and issue #1 was a great start. Mister Miracle for me, was always one of those characters I always wanted to know more about. He intrigued me in every story he was in. A quick history of the character. He was created by the legend Jack Kirby and debuted in 1971. Miracle aka Scott Free, is one of the New Gods created by Kirby. They live on the twin planets New Genesis and Apokolips. The two worlds are polar opposites and were always in constant war. New Genesis is a utopia that is ruled by Highfather and Apokolips is a dystopia ruled by the Superman villain most of us know as Darkseid. Scott Free originates from New Genesis but to stop the war between their two worlds, Scott was given to Apokolips and Orion, the son of Darkseid, was given to New Genesis. Scott Free’s life was full of torture and pain as a citizen of Apokolips. It was there where he honed his skills to become the universe’s greatest escape artist. He eventually escaped from Darkseid and came to Earth where he eventually became Mister Miracle. Throughout the years, he’s been all over the place in comics. I have mostly seen him in Justice League International where he teamed up with heroes such as Batman, Blue Beetle, Booster Gold, and Captain Atom. Tom King is a brilliant writer. He and Mitch Gerads are a powerhouse creative team that was behind the critically acclaimed book Sheriff of Babylon. King also wrote the critically acclaimed Vision series last year as well. This comic was weird, but in a very good way. It didn’t feel like I was reading a comic at times and I think that credit should go to the innovative art of Gerads. It all starts with an image of a man filled with melancholy. The man known as Mister Miracle. This comic as I said didn’t feel like a comic at times. The first image we see is Scott Free himself. He looks incredibly sad and it sets up the tone for this entire story. King is giving us a look at the tortuous life of a person who appears to be happy, but inside, is dead. The next page shows Free bleeding on the ground. He attempted to kill himself. Mister Miracle has escaped everything in his life. Everything except death. Can a man escape death? What is death? Miracle is basically immortal and immune to all types of diseases and poisons. But this story, starts off with him attempting to kill himself. The next couple of pages show Scott at the hospital. His wife, Big Barda, is crying at the hospital as she waits to see if her husband will live. Scott on the other hand lies in the hospital, that same sadness on his face. Two images of him as Mr. Miracle pop up while he’s in the hospital. One of them was the first appearance of Miracle in the comics, and the other was just him on a television claiming he can escape anything. 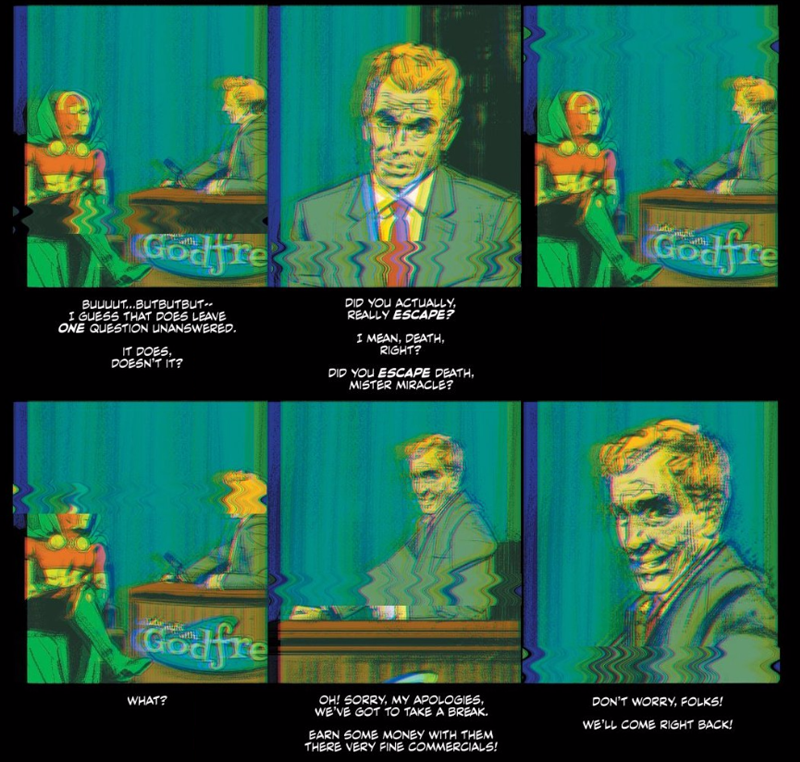 Most of the images of Mister Miracle in this comic involve him smiling. To the world, he’s an outgoing superhero, but as I said, this story is about the struggles of Scott Free, the man under the mask. Scott is eventually released from the hospital. He’s with Barda on the couch when a fellow New God comes into their living room. It’s Orion, son of Darkseid but he was raised on New Genesis by Highfather. An interesting scene happens next. It seems as if it was some sort punishment ritual. Orion begins punching Scott and tells him to stand. With every punch, Scott slowly gets back up and says, “Standing.” Orion continues to pun h him until Barda steps in. Orion claims he’s teaching, but Barda reminds Orion that she and Scott were raised tough on Apokolips, while his life was filled with privilege on New Genesis. Orion’s stay is short, he leaves and Barda comforts Scott. An interesting part happens next. Scott looks at Barda and he asks he why her eyes look different. He tells her that her eyes were blue, but now they’re brown. Barda jokingly tells Scott that her eyes have always been brown. The coolest part of the comic comes up next. Artist Mitch Gerads sent my brain on a trip with the art in this next scene. It looks like an old recording from the 80’s and was some of the coolest art I’ve ever seen. The scene starts with Scott in his Mister Miracle outfit. He’s on a talk show and the scene starts with him performing an escape act. Of course, he escapes, the crowd applauds and he’s smiling with joy. Then, Miracle sits down with the talk show host and they talk about his recent struggles. The host wastes no time. He asks Miracle about his attempted suicide and Miracle doesn’t shy away from the question. He explains that he wanted to escape death because no one else can. While he’s talking, King and Gerads use nine panels to show the varied emotions of Miracle. I think this was used to show how over the top Miracle is when he’s in character. He’s nothing more than a character when he’s in the costume. Similar to Batman except his shield is joy instead of anger and sadness. The interview ends with the host asking the question I think we all want to know. Did Mister Miracle escape death? He asks the question and the 7th panel on the page distorts Miracle and the host the most as Miracle answers, “What?” The host swiftly cuts to commercial and the scene is over. I LOVED this scene. The art, the storytelling, it was near perfection. You get a solid look at the character of Mister Miracle and the nine-panel technique did wonders for both King and Gerads. The next scene we get is short but it’s the first scene where some superhero plot starts to show. Scott is back on New Genesis talking to Highfather. Father tells Scott that Darkseid has gained access to the anti-life equation, which is basically the ability to shape reality. Father tells Scott that he has a spy in Darkseid’s inner circle and that things have reach a point of no return. It was a short scene but a good setup for the upcoming story. The last part of this comic involves another weird scene. Miracle is with a man named Oberon who tells Miracle a joke that the comic opened with. The joke involved a kid proclaiming he was a god. The kid from the joke appeared to be Scott himself. Barda comes into the room and she tells Scott she knows he could use some company since he doesn’t like being in the studio by himself. Miracle tells her that Oberon was there, but Barda tells him that Oberon has been dead for at least a month now. Scott is distraught as he walks through his house while Barda sleeps. He then gets a call from Orion saying that Highfather is dead and Darkseid’s power is growing. Barda and Scott suit up and head out for New Genesis. Scott confesses something to Barda. Throughout this entire comic, he’s been off, something hasn’t been right. He tries to tell Barda, but she dismisses him. She tells him that there’s no time for his feelings right now, especially with the final war looming. Scott doesn’t care. He tells Barda that he can’t escape whatever’s wrong with him. Barda responds though by punching Scott, resuming the ritual Orion started earlier. Scott stands, they step through the portal and the issue is over.